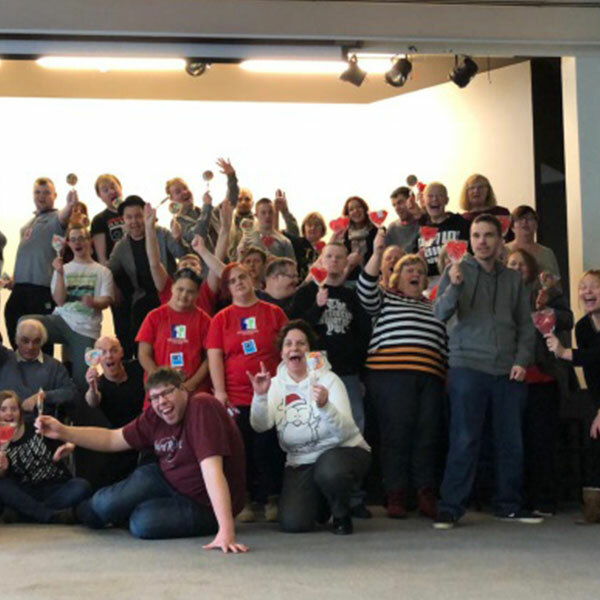 Creative ambassadors with a range of disabilities from a Wolverhampton theatre group travelled to Belgium for skills training in performance and live streaming. The participants, from Mozaic Theatre, part of the City of Wolverhampton Council’s City Links group, took part in the five-day event thanks the University of Wolverhampton’s work on the Yes We Are In project, an Erasmus+ strategic partnership which helps disabled adults with internet, social media and smartphone skills. Accompanied by artistic and support staff, ambassadors from theatre groups in Belgium, Finland, Croatia and Northern Ireland met in Brussels to train in creative acting techniques and create their own performances. They took part in workshops in clowning, physical theatre, mime, imagination and facial expression. The training event finished with a 20-minute performance by each group, and Mozaic Theatre produced a music and mime piece about memories. All the teams bridged the language gap to work together, and to take away the meaning of each performance. In many cases, the experience was enough to move ambassadors and staff alike to tears. The ambassadors will meet again at training events in Croatia and Finland, before each hosting a final performance in their home theatre which brings in the four other groups with the aid of livestreaming. The in-person training events aim to bring them together as a cohesive and tight-knit group, enabling them to co-create across all cultural and language barriers. Yes We Are In is funded through the Belgium National Agency and coordinated by organisation GC De Zeyp. Across Europe, more than 30% of disabled adults – compared with 11% of non-disabled adults - have never used the internet. This project will make participants more familiar with use of smartphones and social media, as well as showing them how to work together using livestreaming. It also puts each theatre group in contact with peers from a range of other countries, and in front of a wider audience. The project is an example of innovative, multidisciplinary approach, combining topics of lighting design, health, wellbeing, psychology, and built environment.